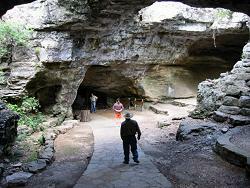 Image: the entrance area of Longhorn Caverns. Location: 15km south west of Burnet, Texas. Hwy. 281 north from San Antonio or south from Dallas to Park Road 4. 10km on Park Road to the Park Headquarters. Open: Park: all year except Christmas Eve and Christmas Day, daily 8-22. Cave: Memorial Day-Labor Day Mon-Fri 10-18, Sat-Sun 9-17, Labor Day-Memorial Day Mon-Fri 10-15, Sat-Sun 9-17, visitor center opens one hour earlier. 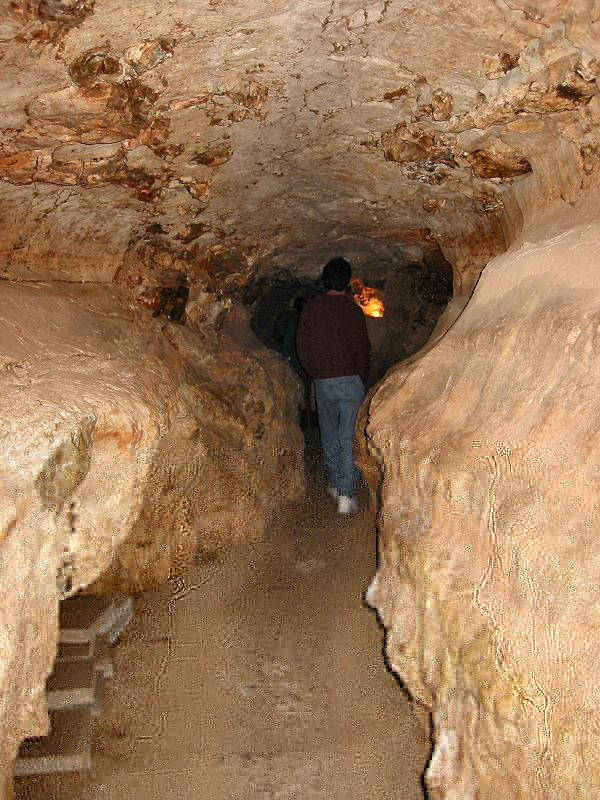 Wild cave tour: Sat 15:15, reservation required! Fee: Adult $8.00, Children (6-12) $4.50, Gold TCP Holders $7.00, Parklands Passport Holders $7.00. Has been used as a shelter since prehistoric times. Known to the Indian for a long time. 1840's discovered by the white man, when he arrived in this area. 1861-1865 during Civil War gunpowder was manufactured and stored in this cave. 1870's outlaws like Sam Bass used the cave as hideout. 1920's site of a night club/dance hall. 1932-1937 acquired from private owners. 1932 dedicated a state park. 1938 opened to the public. 1971 dedicated as a natural landmark. 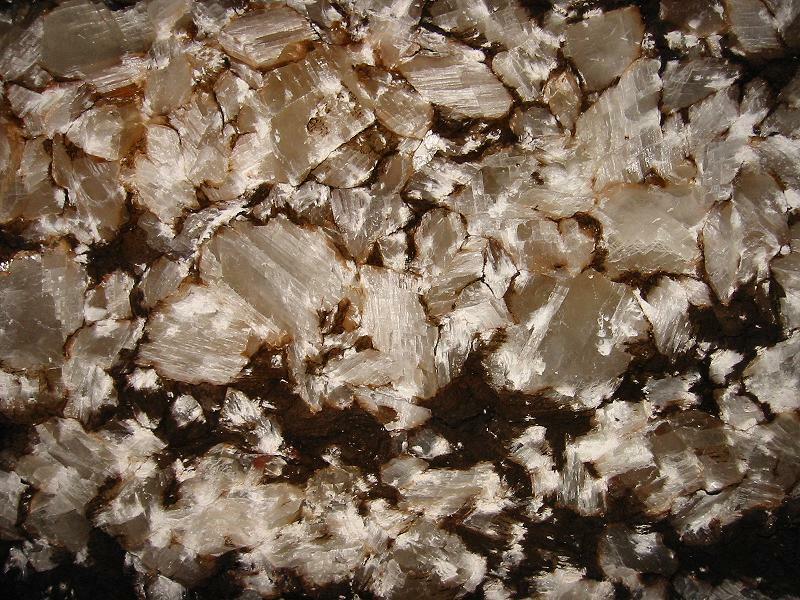 Image: erosive forms, a result of the origin as a river cave. Longhorn Caverns was formed as a river cavern, which explains its tyical character. The cave has very little formations but shows the impressive results of running water. Among legends about the Longhorn Caverns is one, that the outlaw Sam Bass hid a $2 million cache of stolen money inside. Legend also says, Texas Rangers rescued a kidnapped girl from Indians in the cave. 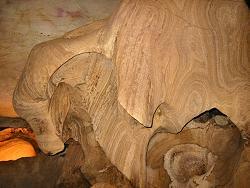 Longhorn Cave Tours Inc., official website. TPWD: Longhorn Cavern State Park, official website.